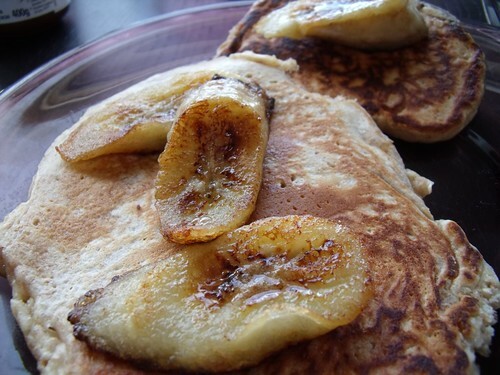 It seems that no matter how I tweak Yumarama’s World’s Best Pancakes Recipe, I can’t go wrong. It really does make the world’s best pancakes… and this being my week of flatbreads, I’d like to share my version of them with you. My friend Louise‘s family has a sugar bush, and I am lucky enough to get their gorgeous Quebec maple syrup. I’m always looking for an excuse to eat it, and these pancakes fit the bill as the perfect accompaniment! Sift dry ingredients together in a mixing bowl. In a separate bowl, combine wet ingredients and add to dry ingredients. Let batter rest for 10 minutes. Add melted butter or oil to batter. Pour batter in a hot non-stick pan (I like mine about 3″ in diameter), once the surface has small bubbles, flip the pancakes over and continue to cook until the pancakes are cooked through. Serve with maple syrup, and fresh fruit. 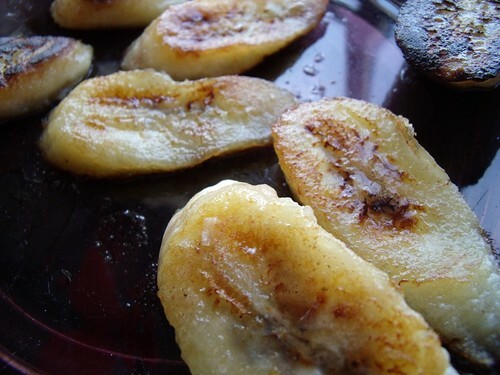 (I must admit to frying up a few banana slices in a bit of butter for a morning treat). Jeanne — you must be near the point where you have extra starter from feeding your new beast!! These will be great with your new starter!